Immotion Group has secured a contract win with Merlin has announced in a recent trading update. The UK-based immersive virtual reality, out of home entertainment business has significantly expanded its relationship with Merlin, the world's second largest leisure operator. Following a successful revenue share trial in Lego Discovery Centres in Boston, US and Manchester, UK, Immotion Group and Merlin have agreed to continue the roll out of its VR Cinematic Platforms across the majority of the Lego Discovery Centres estate, as well as a Legoland hotel in Germany. In addition, Merlin has also agreed to extend the relationship to cover an initial trial in three Sea Life Centres, one based in Germany and two based in Australia (subject to contract). The Sea Life Centres will operate Immotion Group's 'subsea edutainment' experiences. Subject to the trial results, the intention is to roll the "Blue Ocean" VR cinematic experiences out across the wider Sea Life estate, which currently numbers 49 Sea Life Centres. Talks continue with Merlin regarding other opportunities. In addition to the existing two Lego Discovery Centres sites, each containing eight headsets each, Immotion Group will install, subject to final contract, a total of 42 new headsets across the Lego Discovery Centres estate, six in Legoland Germany and 18 headsets in the three Sea Life trials, taking the total headsets in operation on a revenue share basis with Merlin to 82 by end of Q1 2019. At the same time, Lego Discovery Centres in Asia have purchased a further six machines from Immotion Group, making a total of 47 machines and 94 headsets in the Merlin estate. 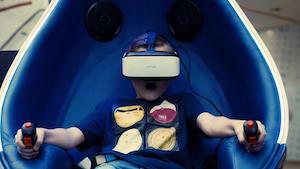 With the exception of the Lego Discovery Centres in Asia, which purchased the VR Cinematic Platforms from Immotion Group, the company operates on a Concession basis with Merlin, sharing the revenue generated from the operations. Immotion Group provides the equipment, content, technical support and training, Merlin operates the platforms and provides the locations. Martin Higginson, CEO of Immotion Group, said: "Our mantra has always been; 'Test, Roll-Out' and the extension of the Merlin relationship to cover the majority of Lego Discovery Centres, along with trials in three Sea Life Centres, is a significant milestone for the company. Endorsement from Merlin, one of the largest entertainment operators in the world, underpins our belief and confidence in our business model. "The commercial success of our recent trials, which are being converted into long-term agreements, has shown our ability to deliver revenue for our partners. This, together with the positive feedback from the paying public and the discussions we are having with shopping malls and leisure operators around the world, demonstrates that there is a growing demand for our superior out of home immersive experiences. "We are also pleased to have agreed terms with Crown Leisure, the UK's largest distributor of entertainment machines, relating to machine sales of the Immotion Group's motion platforms. We believe our offering will be attractive to leisure arcades and family entertainment centres in Crown's key markets. We will now look for similar arrangements in the US. "We believe we are well placed to take advantage of the opportunities ahead of us, and remain extremely confident that Immotion Group is set to become the leading out of home immersive VR operator in the world. We look forward to providing further updates on our progress as they develop." Overall 2018 trading for Immotion is in line with market expectations and H2 2018 VR revenue was in excess of £1m with more than double the anticipated ImmotionVR headsets in place by year-end 2018. The company developed 12 VR content experiences in the year.